Deep Carved Personalized Louisville Slugger Natural Wood Baseball Trophy Bats. A baseball gift that will truly be remembered. 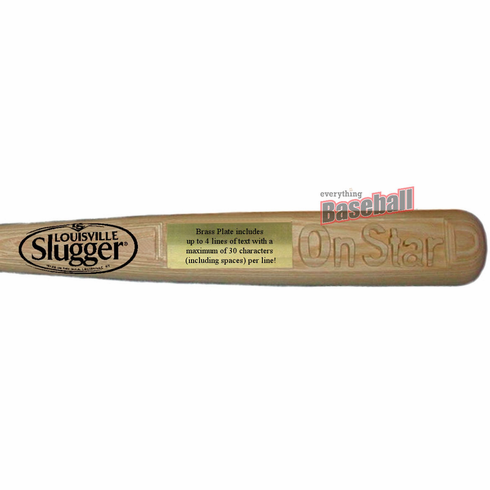 Perfect baseball keepsake - these deep-carved personalized Louisville Slugger trophy bats will make the ultimate impression. 27" or 34" Northern White Ash (natural) Louisville Slugger bats are hand detailed and polished to give the feel of finely finished wood. Block letters are deep carved into the bat - up to 6 characters/spaces. The brass plate can be personalized with up to 30 characters on up to 4 lines!